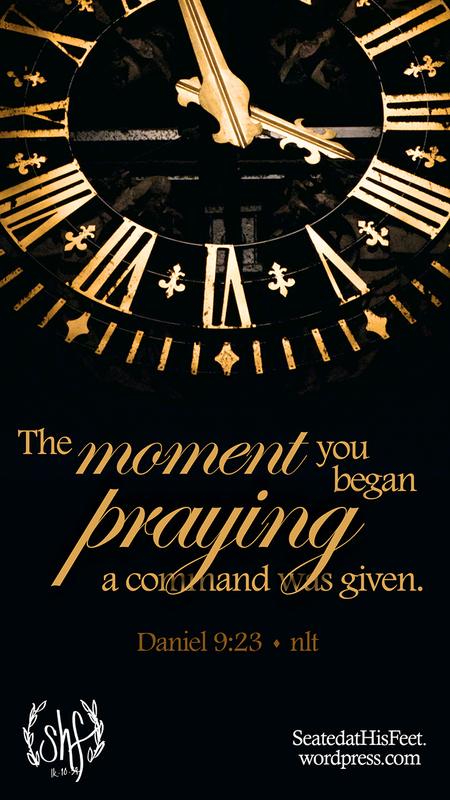 God sent forth a command regarding Daniel as soon as he began to pray. Even though Daniel did not receive an instant answer or immediate response to his supplications, God had already set things in motion behind the scenes. The answer was on its way. Daniel likely began praying at one of the designated daily prayer times, either 9:00am or 12:00 noon. Considering that Gabriel arrived “about the time of the evening offering,” which was around 3:00pm, Daniel could have been crying out to God in “sackcloth and ashes” (Daniel 9:3, NKJV) for three to six hours. Could it have been a longer time, say a full day or even a week or more? The Scripture doesn’t say but does make clear that it was a long enough travail that Daniel was worn out from his pleading. Another clue as to how long Daniel spent in supplication before his answer came lies in the description of Gabriel’s arrival. Daniel says, “Gabriel… came to me in my extreme weariness.” In addition to the weight of the spiritual burden he bore, Daniel would have been physically exhausted from spending an extended time kneeling and fasting. The original Hebrew word yaph used to describe his state of “extreme weariness” can also be translated as utterly exhausted (Strong’s 3288). Chapter 10 sets a similar scene some time later, as another heavenly being appears to Daniel. This second angelic visitor brings a familiar message: “…from the first day that you set your heart to understand, and to humble yourself before your God, your words were heard; and I have come because of your words. But the prince of the kingdom of Persia withstood me twenty-one days…” (Daniel 10: 12,13, NKJV). This time we’re told clearly that the answer to Daniel’s supplications came nearly a month after he began to pray. Yet, during the wait Daniel did not give up. He didn’t complain, “Why bother?” or “What’s the use?” He never moaned, “This is too hard” or “God isn’t answering my prayers.” He stayed in a position of petition. He thanked God for His mercy and forgiveness. He praised God for His righteousness and faithfulness. He recalled the wondrous works God had already done. Like his ancestor Jacob vowed, “I will not let You go unless You bless me!” (Genesis 32:26, NKJV), Daniel refused to give up. He trusted that God saw, had faith that God heard and believed that God would act. How about an example from the New Testament? Indeed, from the very dawn of the New Covenant. Once again, we see God’s angelic messenger Gabriel, this time giving joyful news to an elderly priest: “‘Do not be afraid, Zacharias, for your prayer is heard, and your wife Elizabeth will bear you a son, and you shall call his name John” (Luke 1:13, NKJV). Zacharias replies, “I am an old man, and my wife is well advanced in years” (Luke 1:18, NKJV), so it’s clear that he and Elizabeth had begun praying for a child decades before their petition was granted. In this case, the reason for delay was clear. As the prophesied forerunner of Messiah, the timing of John the Baptist’s birth was crucial. At the close of the period of Israel’s judges, we read of another timely birth that following an extended, painful period of supplication. A woman named Hannah had been childless for so many years that her husband’s second wife could boast both sons and daughters before she could claim a single babe of her own. But God in His infinite wisdom knew the perfect time for her son to make his appearance: “So it came to pass in the process of time that Hannah conceived and bore a son and called his name Samuel” (1 Samuel 1:20, NKJV). This miracle child Samuel grew to become the first prophet of Israel, anointing Saul as Israel’s first king, as well has his successor, King David. Solomon wrote, “Hope deferred makes the heart sick, but a longing fulfilled is a tree of life” (Proverbs 13:12, NIV). The delay can be hard on both body and soul, but we must never forget that our Lord who watches over us “will neither slumber nor sleep” (Psalm 121:4, NIV). As Paul admonished in his epistles and Daniel demonstrated on his knees, let us “continue earnestly in prayer, being vigilant in it with thanksgiving” (Colossians 4:2, NKJV). We trust that we will reap in due time if we don’t give up on prayer, even when we’re weary.